Q: What is your view of Rimba Raya’s project on ecosystem restoration. Have you seen the benefits? A: Firstly, I’d like to thank Rimba Raya for what it has done. I believe Rimba Raya has done something for our community, especially in the 10 villages it’s helping. Even though it’s new and the coverage is small, I can appreciate it because I can feel the ripples and movements from the community after Rimba Raya makes its direct presence to help them. My conclusion is that we start to feel the presence of Rimba Raya. Q: The current focus for Seruyan is mostly on palm oil. But do you think Rimba Raya can become a good example for people in the regency which you head? A: To tell you the truth, we can’t expect much yet because this is indeed new. But I am convinced that Rimba Raya wants to prove to us they have the capability to stir up economic activities in our community. In relation to the rapid expansion of palm oil plantations in Seruyan, we do understand that it has an economic impact which affects the development of the people’s economy. But I don’t want them to lose their identity. To me, the most important aspect is that those villages should not lose their culture, their identity. In fact, a lot of things which they own, can be explored. That’s the thing which I’d like Rimba Raya to show. Q: And Rimba Raya can provide employment? A: That’s right. Employment doesn’t have to come from palm oil only. There are other local products and their strength which can be promoted. What happened was that nobody made a move. Nobody was on the frontline. Rimba Raya’s presence is a proof there is a real movement which can grow the spirit of our people in villages. They have realised there are potentials, and they can be developed. Q: This can serve as a bridge between palm oil and Rimba Raya? A: Indeed. In the end, this will develop an understanding that employment doesn’t have to come from palm oil only. We also see the palm oil industry will gradually be reducing the number of workers. This will give a negative impact to future development. That’s because the palm oil industry will employ less and less workers. Q: Is the number of workers being reduced because of the fall in palm oil prices, or because there’s a global oversupply? A: That’s not the case. This is what is happening. Local people do not possess extra knowledge. They only have the capability to become labourers to do jobs such as cleaning up plantations. As plantations mature, they will become cleaner. This is why the number of labourers will automatically be reduced. I believe alternatives provided by Rimba Raya are correct because local products won’t disappear. If the products are developed day by day, they will multiply. Q: Seruyan is considered to be an underdeveloped area and you strive to improve it. Do Rimba Raya’s contributions have the potential to improve livelihood? A: I would say yes, even though it has yet to cover all villages. I’ve noticed it’s obvious now in two or three villages. Looking back, I am proud of the launch of the shrimp paste products in one of the villages, Sungai Perlu. This has become the pride. I’ve received a report that what may be needed now are tools (to catch shrimps) in order to get more raw material. Demand is surprisingly high. Q: How to approach the local community and tell them about Rimba Raya’s projects. What is the best way if we want to involve the government? A: The best way is the government through related sectors, and through socialisation. The related sectors are, for example, industry, agriculture and fishery. Then, the village apparatus will be in communication with the local government. I believe that’s where our role can be implemented. Eventually, and if needed, we are actually ready for fund collaboration. Q: So there’s funding available? A: As long as the programmes are clear and for the benefit of local people, we are ready to collaborate on funding. 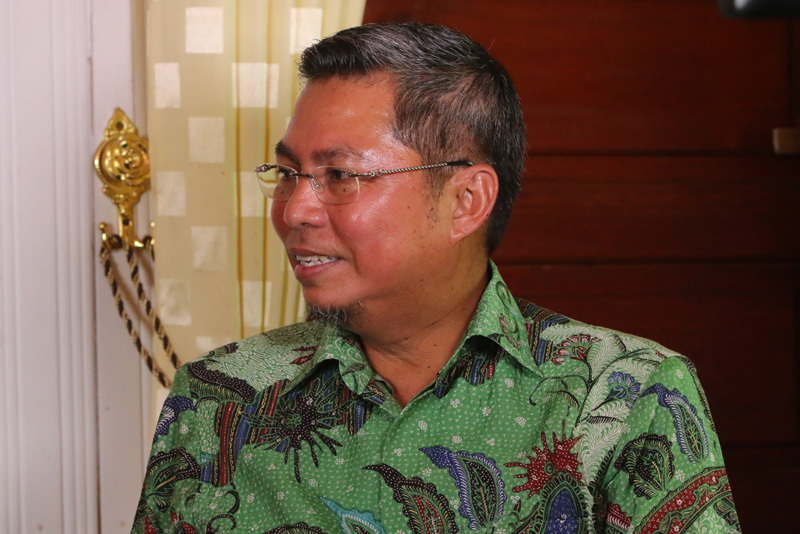 Q: The media in central Kalimantan have written about the harmonious relations between Rimba Raya and the government. Is that something which needs to be maintained? A: I would say it’s not an exaggeration if the media say we have a harmonious relationship because I do feel the government needs help from a third party to give feedback and motivate people in villages. One thing I need to say is that now there are special budgets for villages, and this is huge capital. There many villages, and I won’t mention names, but there are also some villages which until now still have no clue what to do with the huge funds. I think it will be more useful if the villages with the existing funds collaborate with Rimba Raya to stir up the economy of the people. Q: Can we assume that when you said that land should not change hands, you specifically talked about palm oil plantations? 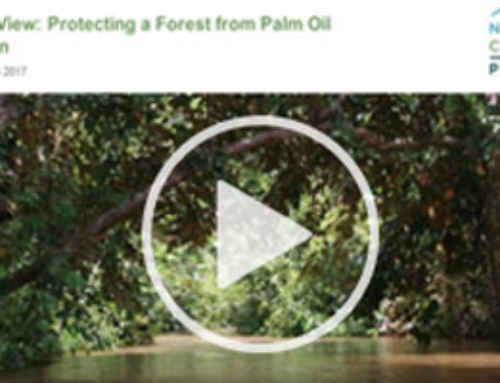 A: That’s happening because the impact of palm oil plantations is extraordinary. We do understand that land which initially had no value in Seruyan, then became so valuable after palm oil plantations sprang up. That has influenced the way people perceive things, their point of view because they want instant results. They’ve got income by giving up their land and other things, but they don’t realise that one day it will put them into trouble. This is why I believe that from now to later, the presence of Rimba Raya is badly needed because it could provide an understanding to local people they don’t have to depend on anyone. Because we have our own natural resources here. Q: Do you think eco-tourism is important? When will you start? A: If we say it’s important, it is important. If you ask me when it can be done, I can’t answer the question yet because they will be a lot of preparation. It’s a long-term preparation. Once again, it’s important and preparation should begin now. Q: Can you explain the main preparations. Two or three main points? A: The first one is infrastructure, and then improving of the quality of education. Infrastructure and education are the key words. Q: Are forests very important for people of Seruyan? A: Very important. Forest is part of life in Seruyan. Actually, from generation to generation, the people can’t be separated from the forest. I can assure you forests are extremely important because they are an integral part of the life of the Dayak people. Because it is important, then there should be real efforts (to protect forests). That is why from the beginning I already said that I am ready to support efforts by Rimba Raya because I understand and I was born here. I do understand the natives here, the Dayaks, are longing for a life surrounded by forests. But bear in mind, we talk about a prosperous life surrounded by forests. Q: Any feedback for Rimba Raya? A: My feedback is that our potentials are great. I want Rimba Raya to make use of the funds disbursed by the government to villages. Rimba Raya can cooperate with the government to make use of the funds for more productive things. Rimba Raya should develop a role to motivate them so that the money can be transformed into extremely productive funds in villages. I guess my message is that there should be a cooperation with village and district governments to make the most of the funds, in addition to the funds which may be disbursed by Rimba Raya itself. Q: On illegal logging, do you think we need help from the police force or military to tackle it?